For other uses, see Family Man. Jack and Kate, who have been together since college, are at JFK Airport, where Jack is about to leave to take up a twelve-month internship with Barclays in London. Kate fears the separation will be fatal for their relationship and asks him not to go, but he reassures her, saying their love is strong enough to last, and he flies out. The scene fades out to "13 years later": Jack is now an unmarried Wall Street executive in New York City, living a carefree bachelor's life. At work, he is putting together a multi-billion dollar merger and has ordered an emergency meeting on Christmas Day. In his office, on Christmas Eve, he gets a message to contact Kate, but, even though he remembers her, he dismisses it, apparently uninterested. On his way home, he is in a convenience store when a young man, Cash, enters claiming to have a winning lottery ticket worth $238, but the store clerk refuses him, saying the ticket is a forgery. Cash pulls out a gun and threatens him, so Jack offers to buy the ticket and Cash eventually agrees. Outside, Jack tries to help Cash, to which he responds by asking Jack if anything is missing from his life. Jack says he has everything he needs, whereupon Cash enigmatically remarks that Jack has brought upon himself what is now going to happen, and walks away. A puzzled Jack returns to his penthouse and sleeps. On Christmas Day, Jack wakes up in a suburban New Jersey bedroom with Kate and two children. He rushes out to his condo and office in New York, but both doormen refuse him entrance and do not recognize him. Jack runs out into the street and encounters Cash driving Jack's Ferrari. Although Cash offers to explain what is happening, all he says is a vague reference to "The Organization" and that Jack is getting "a glimpse" which will help him to figure out for himself what it's about. Jack slowly realizes that he is living the kind of life he might have had if he had stayed in the United States with Kate as she had asked. He has a modest family life, where he is a car tire salesman for Kate's father and Kate is a non-profit lawyer. Jack's young daughter, Annie, thinks he is an alien but a friendly one and assists him in fitting into his new life. With a few setbacks, Jack begins to succeed, bonding with his children, falling in love with his wife and working hard at his job. Taking advantage of a chance meeting when his former boss, chairman Peter Lassiter, comes in to have a tire blowout fixed, he impresses him with his business savvy and Lassiter invites him to his office, where Jack worked in his 'other' life. There, after a short interview, Lassiter offers him a position. While he is excited by the potential salary and other perks, Kate argues that they are very happy and they should be thankful for the life they have. Having decided that he now likes this 'other' life, Jack again sees Cash, now a store clerk. He demands to stay in this life, but Cash tells him there is no choice: "a glimpse", by definition, is an impermanent thing. That night, Jack tries to stay awake, but fails and wakes the "next day", Christmas Day, to find himself in his original life. He forgoes closing the acquisition deal to intercept Kate, finding her moving out of a luxury townhouse before flying to Paris. Like Jack, she has focused on her career, and has become a very wealthy corporate lawyer. She had only called him to return a box of his old possessions. He chases after her to the airport and, in an effort to stop her leaving, describes in detail their children and family life he had seen. Intrigued, she eventually agrees to go with him for a coffee. From a distance, they are seen talking animatedly over their coffees as the credits begin to roll. The Family Man opened at #3 at the North American box office making $15.1 million in its opening weekend, behind What Women Want and Cast Away, which opened at the top spot. After 15 weeks in release, the film grossed $75,793,305 in the US and Canada and $48,951,778 elsewhere, bringing the film's worldwide total to $124,745,083. The film received mixed reviews from critics. Rotten Tomatoes gave the film a score of 53% based on 128 reviews, with an average rating of 5.49/10. The site's consensus states: "Despite good performances by Cage and especially by Leoni, The Family Man is too predictable and derivative to add anything new to the Christmas genre. Also, it sinks under its sentimentality". Metacritic reports a 42 out of 100 rating based on 28 reviews, indicating "mixed or average reviews". Chris Gore from Film Threat said: "If you're looking for a heartfelt, feel-good holiday movie, just give in and enjoy". Matthew Turner from ViewLondon said: "Perfect feel-good Christmas-period family entertainment. Highly recommended." Common Sense Media and Redbox both rate it 4 out of 5 stars. Movie guide.org rates it four of four stars, noting "The Family Man is a heart-rending movie. Very well written, it makes you laugh and cry. Better yet, it’s an intentionally moral movie. It wants to prove that everyone needs love..."
Emma Cochrane from Empire in 2015 wrote: "This is exactly the kind of adult fantasy you want to see at Christmas and, as such, it's highly enjoyable entertainment", and gave the film 3 stars out of 5. ^ "THE FAMILY MAN (12)". British Board of Film Classification. December 5, 2000. Retrieved February 1, 2016. 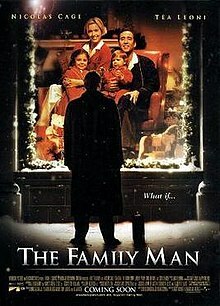 ^ a b c "The Family Man (2000)". Box Office Mojo. Internet Movie Database. April 5, 2001. Retrieved February 1, 2016. ^ "The Family Man (2000) - Weekend Box Office Results - Box Office Mojo". ^ "The Family Man (2000)". Rotten Tomatoes. Flixster. Retrieved February 1, 2016. ^ "The Family Man reviews". Metacritic. CBS Interactive. Retrieved February 11, 2015. ^ "Rotten Tomatoes". December 22, 2000.